It's that time of year again. Zucchini time!! I look forward to this time of year - zucchini are so satisfying to grow. I swear, you just plant the seedlings, water them when you think of it and they just go nuts! I love them. And they taste good, so there's another plus in the pro column. In the Pacific Northwest, my zucchinis hit a few weeks before the tomatoes are ripe, but when they all come in together, it's magic. For complete pie dough instructions, click here. Step one - make the pie dough and let it rest in the fridge. While the dough rests shred zucchini and wrap it in a clean dish towel and weight it so the water starts to come out of the zucchini. Next, chop onion and basil and shred cheddar cheese. In a skillet, melt one tablespoon of butter and add the red pepper flakes and the onion. Saute onion for about 5 minutes until it's starting to become translucent. Roll out the chilled dough and fit it into the pie plate. I am terrible at making pretty pies edges, but I try my best. 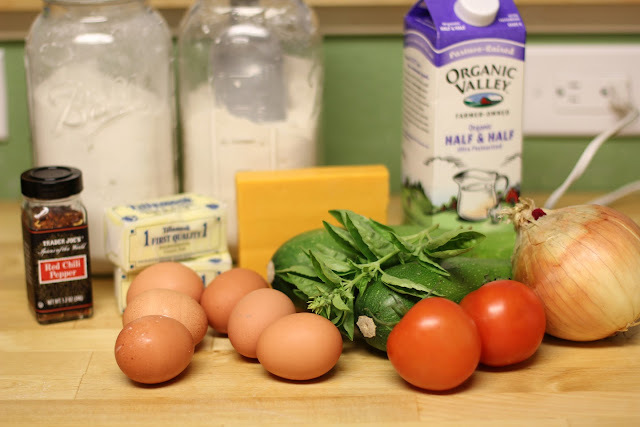 Mix together the eggs, half and half, zucchini, the basil, salt and pepper, the cooked onions and half the cheese. Mix together until well combined. Fill the pie shell with the egg and veggie mixture. Slice the tomatoes and arrange on the top of the pie. Cover the pie and the tomatoes with shredded cheese. Bake for 50 minutes to an hour, or until the egg is not jiggly and the crust is toasted. I like using a clear glass pie dish so that I can see when the bottom of the crust is done. 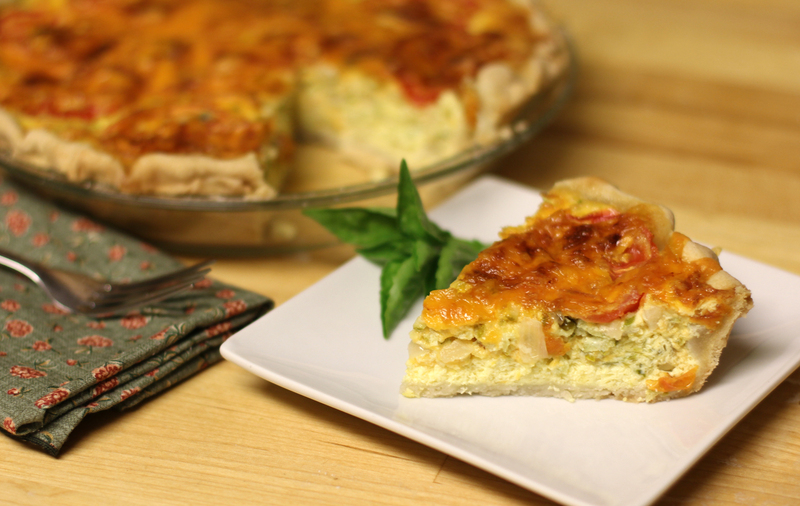 Let the quiche cool a bit, cut and enjoy!